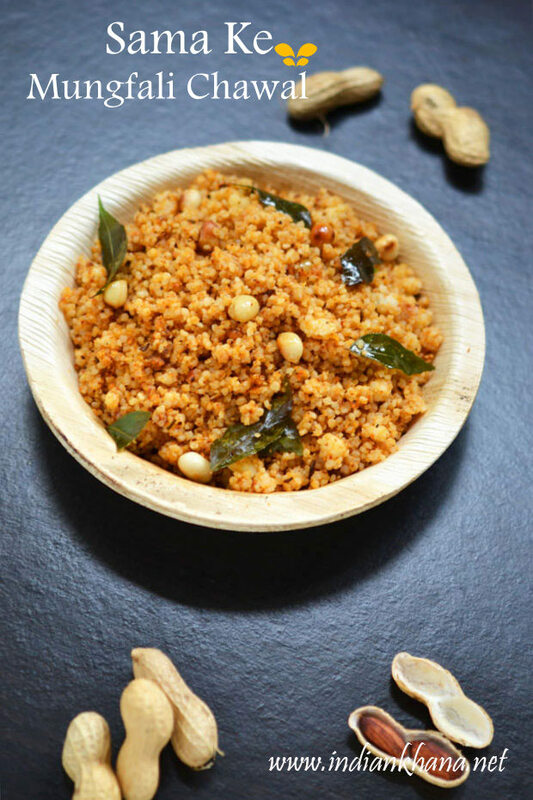 I was thinking what to do something different with swang or barnyard millet for Navratri vrat/upvaas and decided to try peanut rice with it inspired from South Indian style Peanut Rice and it has been a very wise decision, this sama peanut rice is very flavorful, slightly spicy and delicious. Barnyard millet or swang itself has slight nutty flavor along with peanuts it's taste wonderful magic. I have already made this samvat mungfali chawal or Kuthiravali verkadalai sadam few times during fasting and I love this every time, if you looks for something different yet very easy then you will sure like it. We can just prepare the rice and make this peanut rice any time, or making sama rice and peanut mixture side by side also can be done in jiffy. 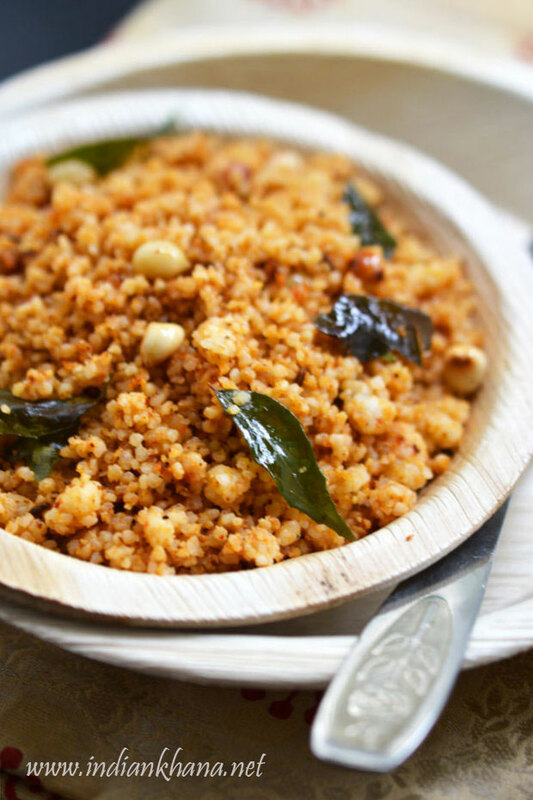 Check out more millets recipes here. 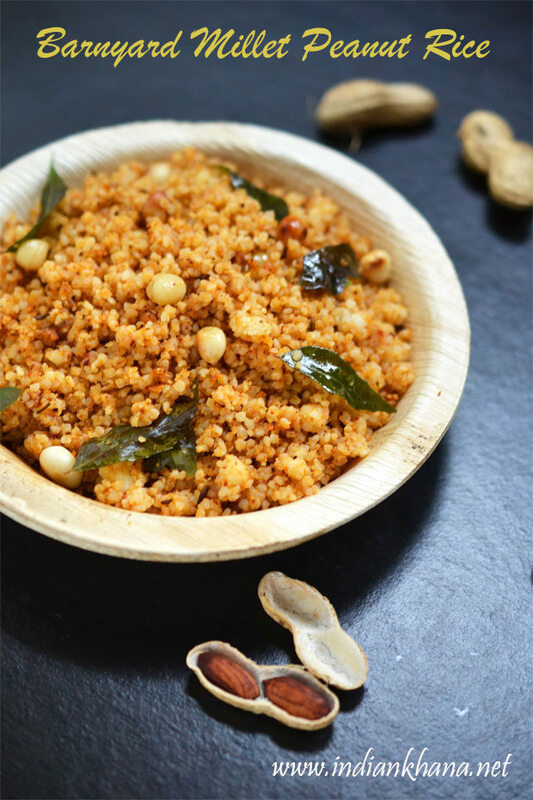 Whether you are fasting or not, if you want to include the healthy millets in your diet then sure try this recipe, and while not fasting you can add regular salt. Know more about millets benefits here. We also doesn't really require any side dish with this sama peanut rice but you can serve with chips or fryums. It's also makes great lunch box recipe as it taste good even if cold. Do try it and let me know how you liked. 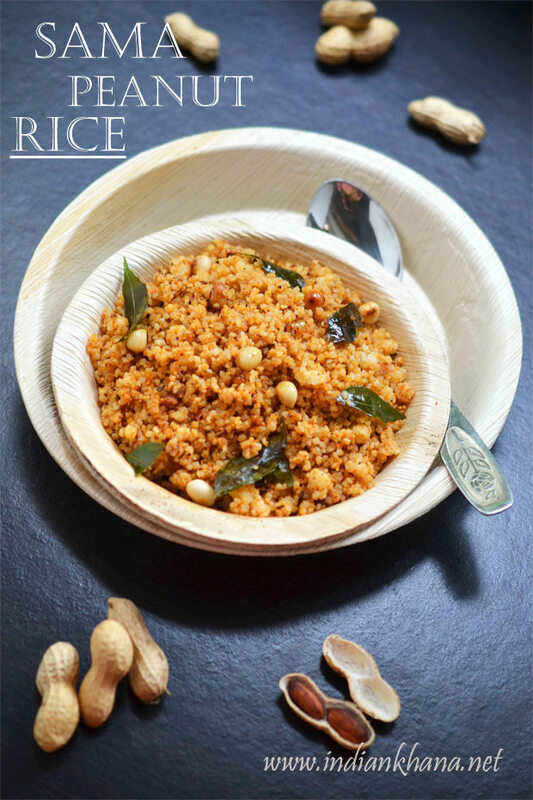 Vegan, glutenfree peanut rice with barnyard millet, perfect for fasting or vrat. Heat water in a pan and bring to it boil, until then wash and soak sama/barnyard millet. Once water starts to boil, add sendha namak/rock salt and sama rice, cover and cook until sama gets fully cooked. You can also cook samvat in pressure cook just like how we cook normal rice, use 2 cups or 2 1/4 water, depends on your sama quality, if using presser cooker use 2 cups of water. While bhagar/sama getting cooked, we can proceed with our peanut mixture. 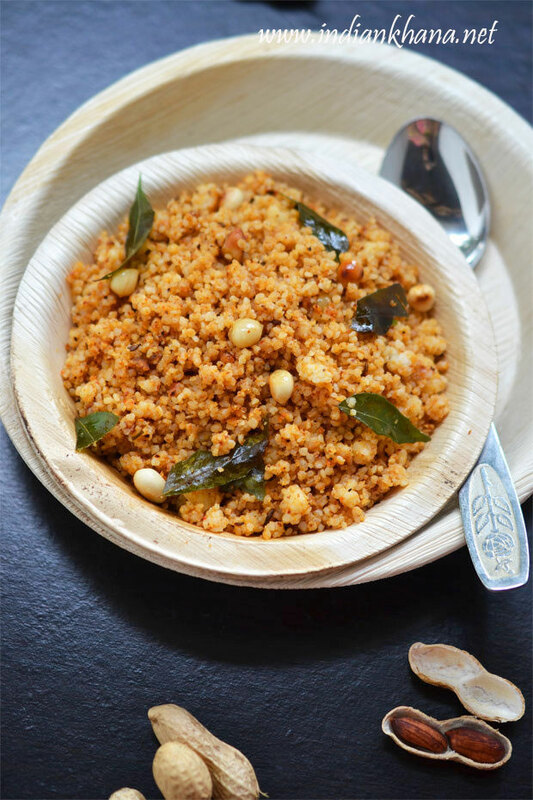 Heat a kadai or pan and roast peanuts until light brown and skin starts to peel off, remove peanuts from pan and allow to cool a bit, once cool enough to handle remove skin by rubbing peanuts between hands, reserve one 1 tbsp of skinned peanuts. Heat oil or ghee in a wok/kadai add dry red chilies and saute for a min in low flame, now add pepper corns, coconut and saute for 2 minutes in slow flame, remove from flame and allow to cool. Grind chilli, coconut, peppercorn first into powder, now add skinned peanuts and grind for 30-40secs or until peanuts becomes slightly coarse powder. To prepare tempering or tadka, in the same kadai or small pan heat oil/ghee add cumin seeds and allow to splutter. add curry leaves, reserved peanuts and saute until curry leaves becomes crispy. Now add cooked sama/swang, peanut mixture and mix everything well, off flame (add more salt/sendha namak if required). Or you can add peanut mixture and tempering to cooked rice mix well. Serve hot, warm or cold with chutney, banana chips or aloo sabzi. This sama peanut rice taste yummy but itself we doesn't really need any side with this. If you don't eat red chili in fast then skip that and add more of pepper corns/kalimirch. You can add cashew nuts in tempering too. 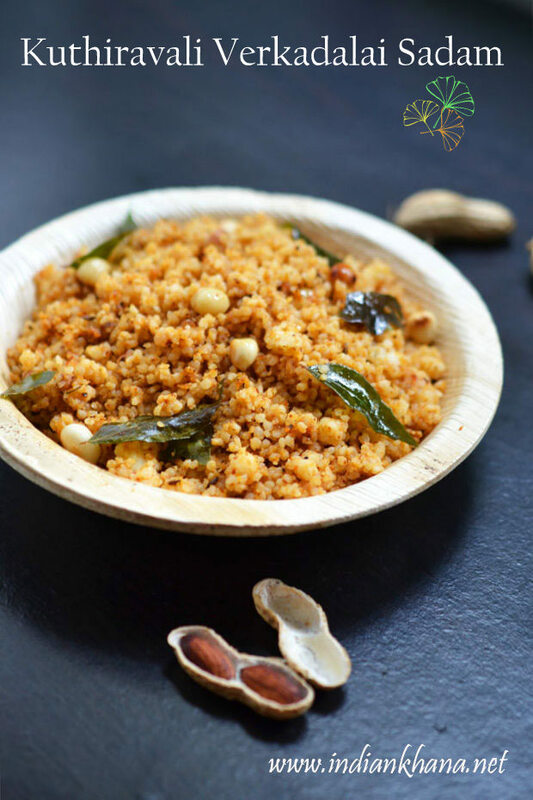 Easy and quick swang mungfali chawal or kuthiravali peanut rice (verkadalai sadam).